In today’s era of fake news, it’s becoming more difficult to separate order from bluster, insight from obtuseness and fact from fiction. And while Silicon Valley is well-known for relying too heavily on inane jargon to make its products sound more amazing than they really are, I’m starting to see this harmless marketing spin devolve into flat-out deception from some of today’s well known tech personalities. The culprit for this deception is none other than the topic du jour of digital transformation. Businesses the world over are scrambling to fortify their defenses from competitors who are becoming more agile and in many instances, re-imagining the customer experience to create new revenue streams. In fact, by 2018, IDC predicts one third of the top 20 in every industry will be disrupted by digitally transformed competitors. It goes without saying that tech heavyweights are more than happy to offer their newfangled services to help ease this transformation – whether they can credibly offer these capabilities (i.e. machine learning, artificial intelligence, internet of things) or not. After attending SAPPHIRE NOW in Orlando last week, one of the world’s biggest business technology events, I now understand why certain forces feel the need to bend the truth and make absurd claims. Heck, I’d be too if I had to try to out-innovate SAP, who is clearly positioned as one of the best business software providers (if not the best) to help companies of all shapes and sizes weather the oncoming storm of digital disruption by making all of its products and services more intelligent. Speaking of business outcomes, Forrester rated SAP the dominant leader in both B2B and B2C e-commerce. Gartner recognized the tremendous progress SAP has achieved in marketing, sales, and service — making SAP the de facto standard for customer engagement and commerce. And in today’s end-user-driven world, user interface (UI) is just as important as an application’s features and speed. With the “intelligent” development system SAP has in place for new applications, fast development and quality UI are not mutually exclusive. 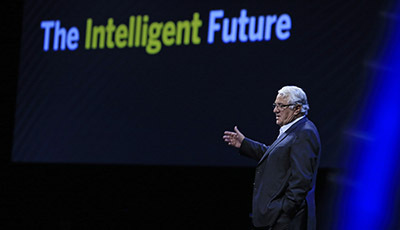 “We want to be fast in application building, and make everything more intelligent,” said Plattner. It shouldn’t take an Einstein to figure out who’s best positioned to lead their customers down a more intelligent path to digital transformation. But having the facts at your disposal is a great place to start.